First off, the exposition is very bland, it skips the opportunity to introduce Scarlet as a character with depth that can be further expanded on by laying out all his traits on a silver platter. "I wonder if I'll make it considering I'm shy, dense, etc. etc." I understand short format, however it fails to introduce the school as a whole, the animation is cute, the art style I find a bit weird. Overall too average, bland and dense for my taste. It looked good, turned out bad. I don't expect great things. The show mentioned a character named Fuka, but she's nowhere to be found in this show. I don't understand this at all. This anime does not make me interested in the game at all. That's a disappointment. I didn't watch past the first episode. I was just that confused. Ozmafia!! It May Be Short, but It's Worth It! 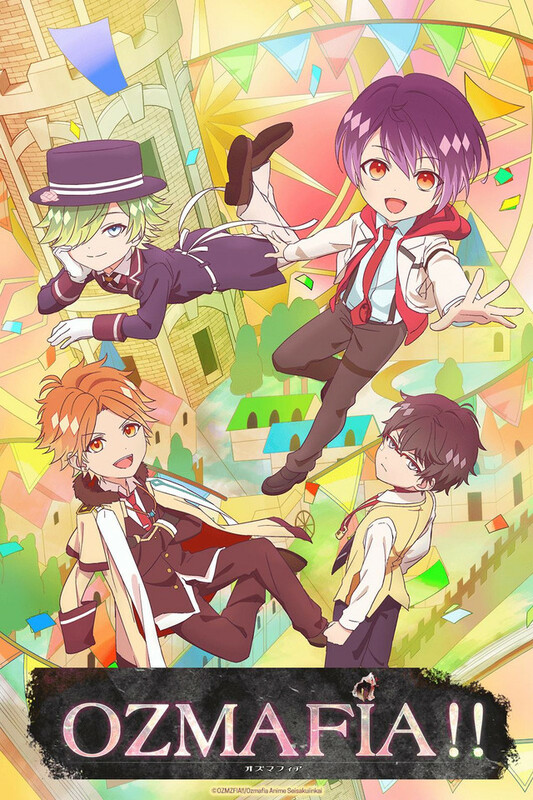 I've been playing through the otome game and when Ifirst watched this, I was disappointed that the episodes where so short, and that the characters were chibi. But I kept watching and that didn't matter to me anymore. I really enjoyed each episode and I wish there were more of them. Now, back to playing the game! I get this is based off of an otome, but seriously this was really boring and disjointed. I have no idea what the original game is even about based on this anime and watching this certainly doesn't make me want to play the game. Plus the art is this cross between regular proportioned anime and chibi that makes everyone look like children. Don't be deceived by the short episodes, this is still a waste of your time. Knowing that this anime is based on a VN, I wasn't sure what to expect. If you're a fan of the VN, you would probably enjoy it. However, it is like watching someone else play a VN/RPG: that is to say, boring. I wouldn't recommend it, as I'm finding it quite dull. The cute art style is quite possibly its only positive. I may update my review once the show is finished: at the time of writing this, there are 8 episodes out. Overall not bad, you probably get more out of it if you've played the game (Highly recommend if you like Otome games!). A Perfectly Normal Boy (TM) transfers to a school populated with characters from The Wizard of Oz, among others. Mafia shootouts ensue? The premise really didn't work in a 3 minute format. I legitimately don't know if the premise could work out in any format, but I decided to give it a try. Honestly there was nothing of substance here. Give it a miss. This is nothing more than a short form anime that goes nowhere. I haven't played the visual novel yet, so have no clue if anything in this show is remotely close to it, but if you think the main character is bland or cookie cutter, that is usually how all protagonists are in a visual novel, since they don't actually exist. You just sort of insert yourself in the story, so... there you go. I thought it was cute and had potential when I first started it. It really didn't add up to anything other than being a bunch of weird cute clips. I found out there was a game today and I thought this was cute so maybe I will give it a try. Yeah if you like things with a ton of depth this may not be for you. I was looking for a short cute thing and found this. I generally watch short things in between other things when they are getting pretty heavy. So if you are looking for a short random thing, this is it. It really doesn't have depth and that was what I was looking for so that is why it got the rating it did. It pretty much achieved what I was looking for. Ozmafia is a bunch of really short (4 min) episodes of various situations that the main character finds himself in and...that seems to be it. There's a bit of exposition about the world surrounding the characters and some short otome-like 'CG' clips at the end featuring various characters but nothing in depth. It did however make me want to check out the game, which I did on steam. The episodes seem like they're based off regular scenes that would happen in the game and thus enjoyable to the well-versed watcher. Regardless of whether you decide to watch this or not, you could get through the entire thing in an hour.